Although the majority of all content on the Internet is written in English, nearly half of all websites are in other languages. And if your small business has customers who speak another tongue, you could be missing out on a ton of sales opportunities by not translating your online content. Here’s a quick overview of why multi-language websites matter, and how you can get started created one. Why Have a Multilingual Website? Both online and off, it’s a well-established fact that people are more likely to purchase goods and services from businesses that communicate in their own language. So why limit the size of your audience by only addressing English speakers? And while it’s true that many modern Web browsers offer to translate pages based on a user’s preferred language, such services are far from perfect. By ensuring that your content can be comprehended by people from another country or culture, you have a lot to gain and little to lose. 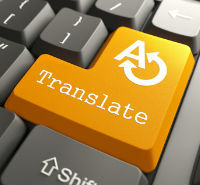 Unfortunately, there doesn’t yet exist a quick and easy way to effectively translate a website into another language. There are some workarounds, though, that might help to some extent. For example, if you already have a website that’s written in English, you could embed Google’s Translate Widget onto your pages, allowing visitors to consume your content in their native language. The problem with this method is the tool performs literal translations that often fail to accurately capture what’s being communicated. And while it’s certainly better than nothing, it could result in copy that’s incorrect, misleading, or just plain embarrassing. Alternatively, some builders have tools in place that can make the translation process rather painless. Wix, for instance, offers a free app that automatically adjusts your website based on which country visitors are viewing it from. And with Weebly​, there’s a little-known way to create a business website in a different language, but it’s a bit more involved and requires some light edits to a site’s underlying code. Current translation tools often fail to fully reflect the content being written, so your best bet is to have a native speaker write, edit, or at least proofread your content to ensure there are no egregious errors that could harm your business, more than help it. Your customers will appreciate this, and your business will exude a more professional appearance. Customers are more likely to stay on your site longer and respond to your calls to action if your content is in their language. So if your online business aims to serve users who don’t read or speak English, a multilingual website can make a huge difference. And while there’s no replacement for having a native speaker craft localized content for your site, other options do exist. Creating bilingual websites isn’t always easy, but depending upon your small business and its audience, the end result might certainly be worth the effort. Looking to learn more about how to create a business website that works wonders? Check out our other articles for valuable tips and tricks.